SSO is the core facility of a new exoplanet-hunting project called Search for habitable Planets EClipsing ULtra-cOOl Stars (SPECULOOS) , and consists of four telescopes equipped with 1-metre primary mirrors. 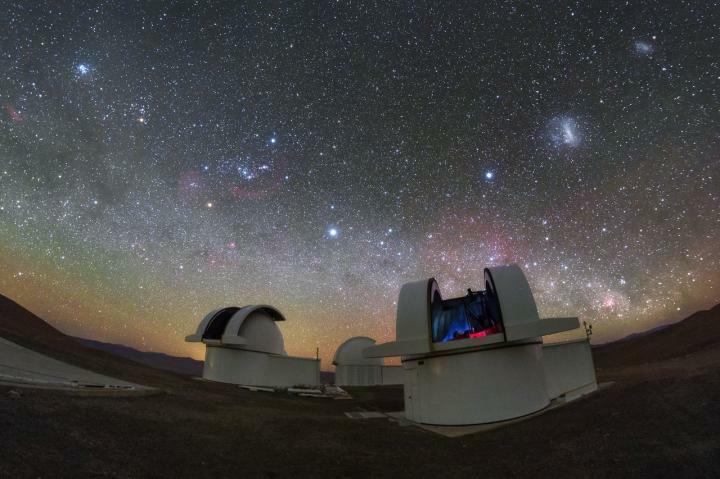 The telescopes — named Io (moon), Europa (moon), Ganymede (moon) and Callisto (moon) after the four Galilean moons of Jupiter — will enjoy pristine observing conditions at the Paranal site, which is also home to ESO’s flagship brown dwarfs, whose planetary populations are still mostly unexplored. Only a few exoplanets have been found orbiting such stars, and even fewer lie within their parent star’s habitable zone . Even though these dim stars are hard to observe, they are abundant — comprising about 15% of the stars in the nearby universe. SPECULOOS is designed to explore 1000 such stars, including the nearest, brightest, and smallest, in search of Earth-sized habitable planets. SPECULOOS will search for exoplanets using the transit method , following the example of its prototype TRAPPIST-1 planetary system. As a planet passes in front of its star it blocks some of the star’s light — essentially causing a small partial eclipse — resulting in a subtle but detectable dimming of the star. Exoplanets with smaller host stars block more of their star’s light during a transit, making these periodic eclipses much easier to detect than those associated with larger stars. There is also potential for an exciting future collaboration with the Extremely Large Telescope, ESO’s future flagship telescope, currently under construction on Cerro Armazones. The ELT will be able to observe planets detected by SPECULOOS in unprecedented detail — perhaps even analysing their atmospheres. Speculoos, or speculaas, is a delicious type of spiced biscuit traditionally baked in Belgium and other countries for Saint Nicholas’s day on December 6. The name, with its sweet connotations, reflects the Belgian origins of the SPECULOOS project. The TRAPPIST project also has a similar Belgian namesake — it was named after Trappist beers, most of which are brewed in Belgium. SSO also received funding from the European Research Council under the European Union’s Seventh Framework Programme (FP7/2007-2013)/ ERC grant agreement number 336480, from the Simons and MERAC Foundations, and from private sponsors.